Let us help you work through your limits and develop a process for ten actions to get way more out of your HubSpot subscription. As we go, we’ll walk you through how to integrate the process into your overall inbound marketing strategy. Start by setting SMART goals. S.M.A.R.T. is a methodology that helps you establish concrete and achievable goals. S.M.A.R.T. stands for Specific, Measurable, Attainable, Relevant, and Time-bound. This step happens outside the HubSpot platform, but will shape everything you do with the software. Measure your company’s current marketing performance in terms of audience size, conversion ratio in the lead process, and customer closure. Take those same numbers and project for realistic growth, perhaps something like 30% more traffic and 1% better conversions. The best thing to do is work backwards from what you want and see what it would take to get there based on your current and projected success. You’ll need to develop at least one solid buyer persona, preferably more. A good buyer persona should be a thorough, researched, and honest profile of the type of person who will buy your product. Name your buyer persona, consult your team for more information, and consider interviewing existing customers. Once you have goals and a buyer persona, you’ll start creation of actual blogs. Use HubSpot’s internal blog publishing feature in the “Content” tab for every one of your releases. If you’re already blogging, consider going back and creating goals and buyer personas if you haven’t done so already. In order to bring readers to your blogs, you will promote your content on social media through HubSpot’s Social Inbox. To really draw traffic, you will need to tap into HubSpot’s Social Inbox tool which allows you to easily manage Twitter, Facebook, LinkedIn, and Google+, all of which can be done through a single dashboard with Social Inbox. In addition, HubSpot is now going to offer Google AdWords and LinkedIn paid ads campaigns so that you can generate targeted traffic with pay-per-click advertising. Once you have the attention of an audience through paid advertising, you’ll want to keep them engaged by following through with a call to action! End each of your blogs with an engaging call to action for your audience. The call to action must be direct, clear, and imperative. Your various calls to action can be managed through HubSpot’s “Content” section. An initial call to action will give your audience access to your premium offer. Premium offers are content downloads like ebooks, guides, and checklists. Best practice is to include an offer at the end of each blog post, that is related to the topic of the blog post. So for example, if 98toGo publishes a blog post on the topic “How to create an editorial calendar”, then we would include a call-to-action button that promotes our “Free Editorial Calendar” offer. In order to receive your premium offer, your call to action will direct people to your landing page where they will fill out your form, usually subscribing to receive future helpful emails from you. Your audience will appreciate the continued service of your premium offer, and through the email subscription you have the opportunity to grow the relationship until your leads are ready to become customers. Landing pages should also be tied into HubSpot’s internal software through the “Content” dropdown. After your leads enter their information into a landing page, immediately respond with a thank-you page and a follow-up email. The Thank-You page is where you’ll deliver the offer immediately to your lead. You also want to send them a follow-up email that links to the offer (the email allows them to have forever access to the offer because it’s saved in their email program, whereas the Thank-You page can be exited). In both the Thank-You page and Follow-up email, you want to give your lead more resources that will give them the chance to move further down your sales funnel. So, for example, a Top-of-the-funnel offer Thank-You page might include a link for your lead to download your Middle-of-the-funnel offer (the next step in the sales funnel). Every email you send should be automated and/or monitored through HubSpot’s email workflow. This will allow you to send the perfect email for wherever your audience is in the process of becoming a customer. For example, once someone shows a certain level of interest in your informative emails, the content can shift slightly towards focusing on your company and your product. Email workflows will automate this process so that you can set it up and forget about it! Plus, the email data reporting that HubSpot gives allows you to monitor things like emails opened, clicks, or other metrics to judge when the time is right to make a change. BONUS: Don’t just stop once you’ve completed the process: monitor, improve, and repeat again. The best way to track progress is through HubSpot’s simple “Reports” interface. Slice the information any way you want to: views to leads, leads to customers, time on page, or anything else you want to check. Find the weak points in your system and improve. There is still so much more to do in HubSpot, but following these simple steps can take you from a HubSpot beginner straight to getting more of the results that you want. 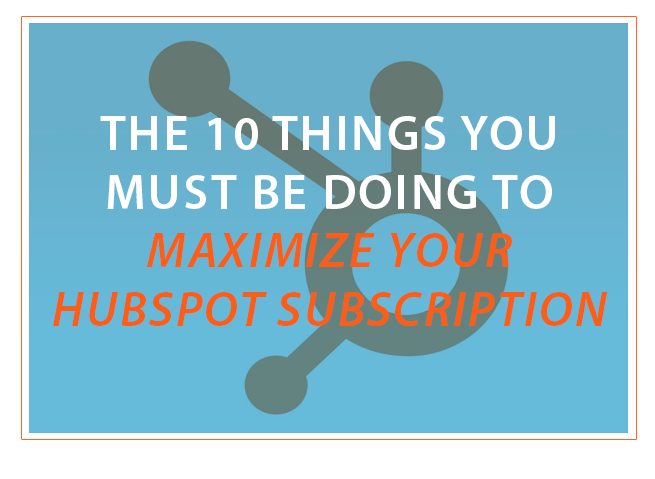 Want More Tips To Really Maximize Your HubSpot Subscription? Grab a copy of our free ebook The Do It Yourself Guide To Successful HubSpot Management, and learn how you can get the best ROI for your marketing investment.